A thinking mind would like to know: in what world does Pope Francis, reside in. It cannot be the world that freethinking minds live in; a world where we are free to try and understand each other instead of hurting one another for thinking or believing differently. A system of forcing ones beliefs down collective throats that have an entirely different outlook on the question of being, can never survive long term. Only a, Live and let Live society, that permits one to speak their mind without reprisal fears of prison or death. 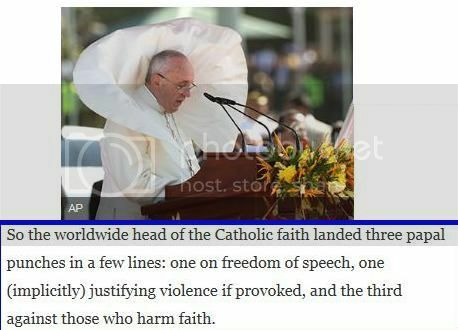 Mr. Pope Francis, I would also like to know, what part of Freedom of Speech do you not understand and how about that Biggie, Separation of Church and State, which benefits religions (as well as individuals) by allowing followers to practice their religious beliefs without the fear of punishment by government? 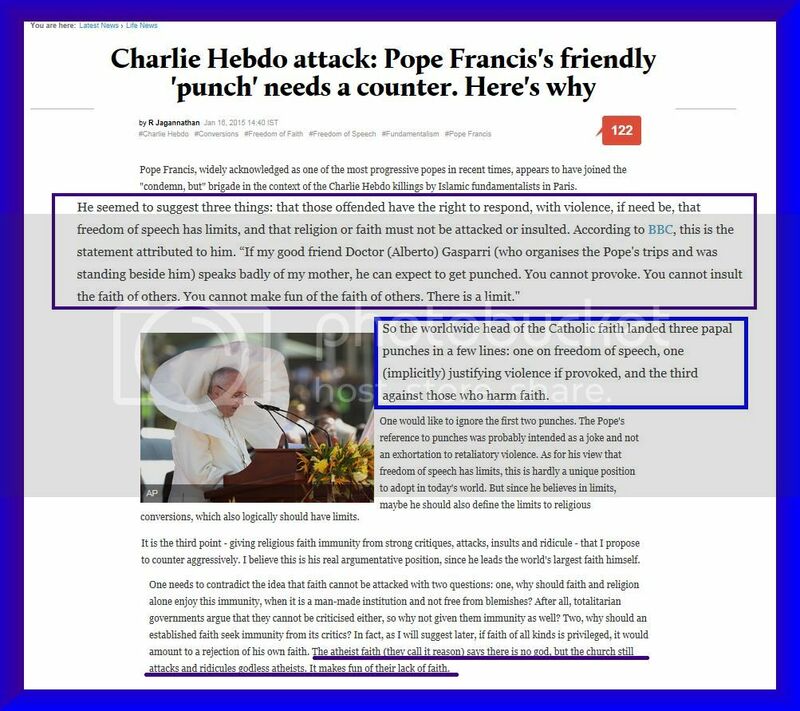 If Pope Francis (by his ridiculous statements that he made after the Charlie Hebdo massacre) wholeheartedly believes in what the convoluted bible passage states, AN EYE FOR AN EYE and can somehow convince all of humanity (not just Catholics) that it should be the law of the land; then why not Bring Back the Guillotines. Bring Back the Dark Ages. Bring Back Stoning for all. If all these (and many more) legal barbarous methods, returned from the Dark Ages and Beyond, to keep people subservient, then 'Critical Thinking' just lost the war and we who make up The Masses shall continue down our evolutionary path with a brain that will most definitely emaciate. Thus, driving us back to the caves where we will huddle and live in fear until the next catastrophic global event or mass extinction occurs.